The Samaranch legacy -- still "amazing"
TIANJIN, China -- The past, present and future of the International Olympic Committee intersected here Sunday in this northern China port city of 13 million people. Exactly three years to the day after he passed away, the Juan Antonio Samaranch Memorial Museum was dedicated, its 16,578 pieces on rich display to tell the story of the former IOC president's unparalleled impact on the modern Olympic movement. "Dear friends," the current IOC president, Jacque Rogge, said in inaugurating the museum, "we know what we all owe to Juan Antonio Samaranch. "If our movement is today strong and united, it is thanks to his visionary qualities and extraordinary talent. His knowledge of the world of sport and his deep attachment to the Olympic values were unquestionable. Juan Antonio Samaranch left us a great legacy that we must conserve and perpetuate. This memorial is the greatest homage we can pay to him." That, and the business at hand Saturday night in the lobby of the Renaissance Hotel in Tianjin, because as Samaranch always understood, the business of the Olympic movement is relationships, and with so much at stake this historic election year, the scene in the lobby served as an intriguing prelude of what's to come. At the IOC's session in Buenos Aires in September, the IOC will elect a new president; decide the 2020 Summer Games site (Madrid, Tokyo and Istanbul are in the race); and perhaps make changes to the Summer Games program (as of now, wrestling, baseball and softball and other sports are in the mix). This museum dedication drew together a clutch of those often mentioned as potential presidential candidates -- nothing being official because nothing is allowed yet to be official, but in alphabetical order: Thomas Bach of Germany, Sergei Bubka of Ukraine, Richard Carrión of Puerto Rico, Ser Miang Ng of Singapore, C.K. Wu of Chinese Taipei. Bach and Ng are IOC vice presidents. Bach is a gold medal-wining fencer turned lawyer who for years has been a senior IOC presence. Ng, a businessman and diplomat, oversaw the enormously successful 2010 Youth Games. Carrión, a banker, has negotiated the IOC's most complex television deals; he had served on the IOC's policy-making executive board until just last year. Juan Antonio Samaranch Jr. of Spain, was here, naturally, along with his sister, Maria Teresa, and some of their extended family; he now sits on the IOC EB. So does Bubka, the former pole vaulter, now a mainstay in track and field and IOC politics. Also here: Sheikh Ahmad Al-Fahad Al-Sabah of Kuwait, head of the Assn. of National Olympic Committees and the Olympic Council of Asia. To be precise, this dedication attracted 24 IOC members (out of 101); four honorary members; and eight international federation presidents. Those numbers are all the more remarkable because the IOC is staging a major assembly in just a couple days in Lima, Peru, the 15th "World Conference on Sport for All." It is testament to the elder Samaranch's hold on the imagination that so many opted to come here. 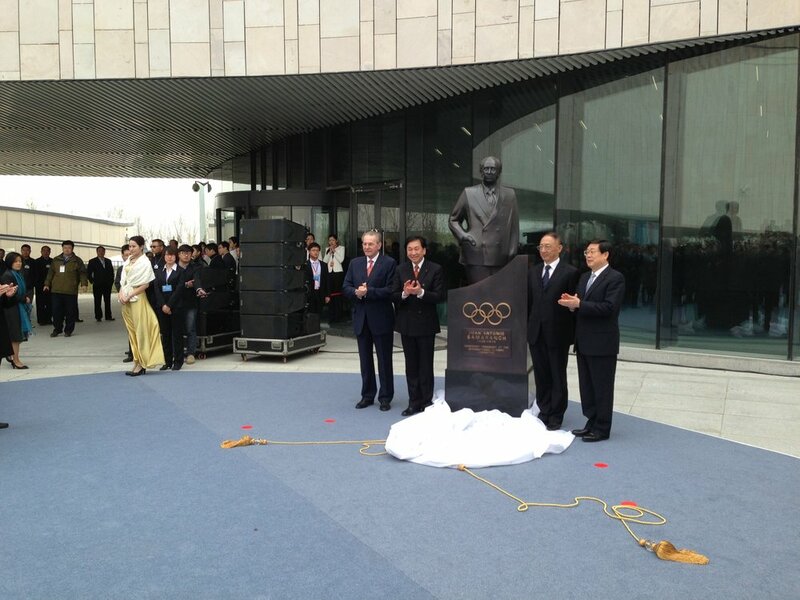 "His wisdom and genius inspired all those who loved the Olympics," Wu said in his speech Sunday. Wu and Samaranch shared an interest in collecting, and before his death Samaranch donated his lifelong collection to Wu, who had become a good friend. It includes books, stamps, souvenirs, paintings, letters, photographs, personal items, manuscripts and texts on Olympic-related themes. Samaranch went to the Chinese mainland authorities in December, 1987, to express his intention to nominate Wu for IOC membership at the session in Calgary in February, 1988. In those days, the relationship between Beijing and Taiwan was sensitive, indeed. Wu went on to be elected without opposition at that Calgary session. He said here: "I really appreciate what he has done for me. He has changed the entirety of my life. I might still be working as an architect in my profession. After this, it totally changed my life. Now -- I want to build a museum. In Chinese, we say, when you drink water, you always think of who gave you the water. This is an important philosophy." The project broke ground in 2011 -- 205,000 square feet, in all, amid a park 45 minutes from central Tianjin. But construction really got underway only last July, finishing for good just before Sunday's formal opening. The project, which cost $61 million, was largely financed by the Tianjin municipal government. The project required express approval by various branches of the Chinese national government -- the first time it had granted such OK to a memorial for a foreign figure, evidence again of Samaranch's stature here. Why Tianjin? Why, for that matter, China for such a memorial? Because Samaranch visited China many times and believed powerfully in the possibilities of the movement here. Indeed, it was at his final IOC session -- in Moscow in 2001 -- that Beijing was selected as site of the 2008 Games. Just a few days later, Rogge was picked as Samaranch's successor. The museum shows a picture of the two men shaking hands on that day. Time keeps turning. Buenos Aires nears. It is three years already, and yet Samaranch's influence on the movement is still considerable. "He was a real human being, with big passion, who loved sport," Bubka said Sunday afternoon, adding a moment later, "His legacy is -- amazing."